A WAM grant will help repurpose a century-old coal storage site at Milwaukee’s inner harbor as part of a continuing effort to improve this gateway to the city. Efforts to repurpose a century-old coal storage site at Milwaukee’s inner harbor will get a boost from a recently issued Department of Natural Resources brownfields award. The award comes from the DNR’s Wisconsin Assessment Monies (WAM) program, and will provide for contractor services worth approximately $25,000. 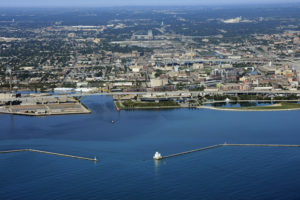 The work will help Milwaukee – specifically the Redevelopment Authority of the City of the Milwaukee (RACM) – assess potential contamination, leading to eventual remediation and redevelopment of the prime waterfront site. The nearly 14-acre site on Greenfield Avenue is located across the street from the UW-Milwaukee School of Freshwater Sciences and is currently a vacant lot that had historically housed fuel oil tanks. Over the years, fill material has been used to shore up a nearby dock wall and fill in a former boat slip. Administered by the DNR’s Remediation and Redevelopment Program, WAM awards provide communities with professional environmental site assessments of properties with known or perceived contamination. Participation in the WAM program requires minimal effort by local governments. Because there is no financial match or project administration involved, the award is an attractive opportunity for communities. In many instances, WAM awards are leveraged with other sources of funding to kick-start repurposing efforts on properties that may have been underutilized for many years.